Honda Insight Pros and Cons | Page 1 of 2 | Why Not This Car? What drives people to buy (or not buy) a certain car? TrueDelta's members share Honda Insight pros and cons based on their real-world driving experiences. 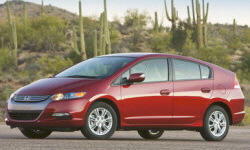 HONDA INSIGHT - Wonderful car... Congratulations Honda! In September of 2010, I chose to buy a car HONDA INSIGHT, as between the various brands that offered similar vehicles with low fuel consumption and equipped with innovative technology, I decided to put the utmost confidence in this car maker who enjoyed, and enjoys an excellent reputation worldwide. 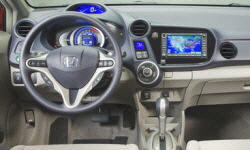 I really liked the dash layout on the Honda Insight. The computer screen is centered and easy to observe while driving, as well as the rest of the dash. Not as easy to pass due to the weak 1.3L engine. Fantastic! Driven frugally, I am getting 46mpg at 60/40 hwy/city driving. oddly, I hated this style on the prius, but love it on the insight, several cool enhancements like LED brake lights and blue accented halogen head lights. Previously drove a 4-door. The hatchback is great for loading and the fold down rear seats let me put in everything I have tried so far. The 2010 Honda Insight is probably the cheapest new hybrid currently available. The Insight has a stiff ride. It makes it seem more sporty, but being more sporty than a Prius is not saying much. If I want sporty, I will get a Boxster or S2000. My family has owned Hondas in the past and my daughter has a honda. Hondas are known to last long and if you keep them serviced keep running for a long time. The highest available at time of purchase. The seats are form fitting and feel like sports car seats with a lot of side support and back support. Getting near 50 MPG is fantastic after owning several cars that barely got 20 MPG. Getting excellent fuel economy (10+mpg above EPA) in the Insight is easy. Getting amazing fuel economy (70mpg on state highways) is possible with practice. Too much road noise. Honda has alot of refinement in the Insight. I wanted to buy Honda over Toyota.